Leaving Richard Gere's awful nasal singing aside, as that horribleness speaks for itself, this movie ultimately is just plain old boring. I simply did not care for Roxie at all, she is not a character that one is cheering for. After all, she did have affairs and kill a man, so why should I feel bad for her since she got locked up and is trying to evade the death penalty. I saw this movie shortly after it came out and did not particularly like it (I generally hate musicals, especially movie musicals) and was not looking forward to the second viewing. I am not going to go into detail on the thread of a plot that exists in the movie (you can look it up online), but generally it follows a young woman, Roxie, who is desperate to enter the world of show business and cabarets, and ends up killing her affair for double crossing her and it follows her trying to get out of prison and the lawyer that is hired to help her. I think the whole thing could be done in about 30 minutes if you left out all the dancing and singing, and there is just not much to see here at all. I think Shannon sums it up best that this movie is simply ‘razzle dazzle.’ It is a boring, nearly plot-less movie covered up by using production numbers and songs. Somehow the Academy fell for it and decided to award it the best picture, that was a horrible mistake. I am not sure which of the others should have won (it was a bit of a soft year for films), probably the Pianist or possibly Gangs of New York, but certainly not this drivel. 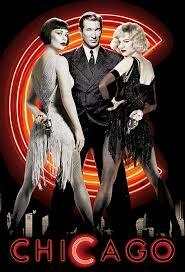 She Said: Nothing but "Razzle Dazzle"
I remember really liking this movie when I saw it in the theatre. Heck, I own it. We're watching my copy right now. Which is all to say I was really looking forward to seeing it again, in that nostalgic "I loved that movie!" Kind of way. So now we've watched it, I'm disappointed, and wondering what I saw in it. Sure, I love musicals, it was visually beautiful, and structurally interesting, but there wasn't enough emotion to carry it through. I wasn't invested in how it turned out, other than to see the next musical number. Heck, there were even parts of it I didn't remember. I'd still like to see it on stage sometime, because musicals were made for the stage, but I'm ready to retire my copy.